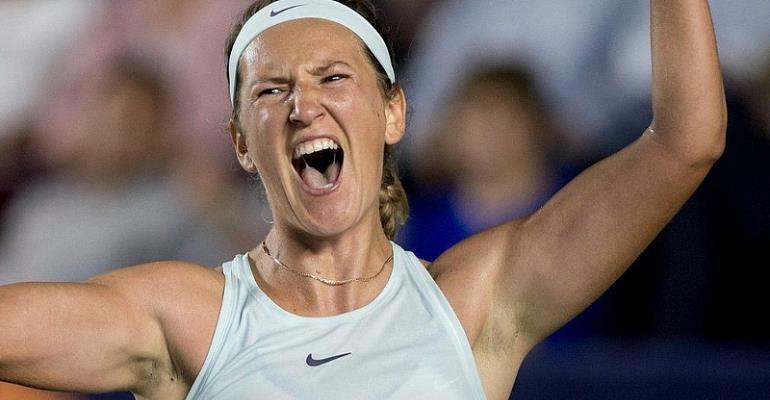 Former world number one Victoria Azarenka reached her first singles final in three years by defeating top seed Angelique Kerber at the Monterrey Open. The Belarusian beat Kerber – another former world number one – 6-4 4-6 6-1. She now faces Spain’s Garbine Muguruza in Sunday’s final in Mexico. “I haven’t won many of those in the last couple years so it’s good that I’m able to turn it around and pick up my level,” Azarenka said. The 29-year-old last contested a singles final in April 2016, winning both Indian Wells and Miami within two weeks before announcing her pregnancy later that year and giving birth to son Leo in December. She returned to the sport competitively the following summer but has been involved in a custody battle with the child’s father which has impacted on her tennis. “I’m getting back used to playing, and I’m trying to make better decisions, better choices under pressure,” Azarenka said after her win against the German. “It’s all about taking one step at a time. To put it all together is always more tricky, so I’m glad that I’m able to put little pieces together in the important moments. Former Wimbledon champion Muguruza earlier reached the final with a 6-2 6-3 victory over Slovakia’s Magdalena Rybarikova.